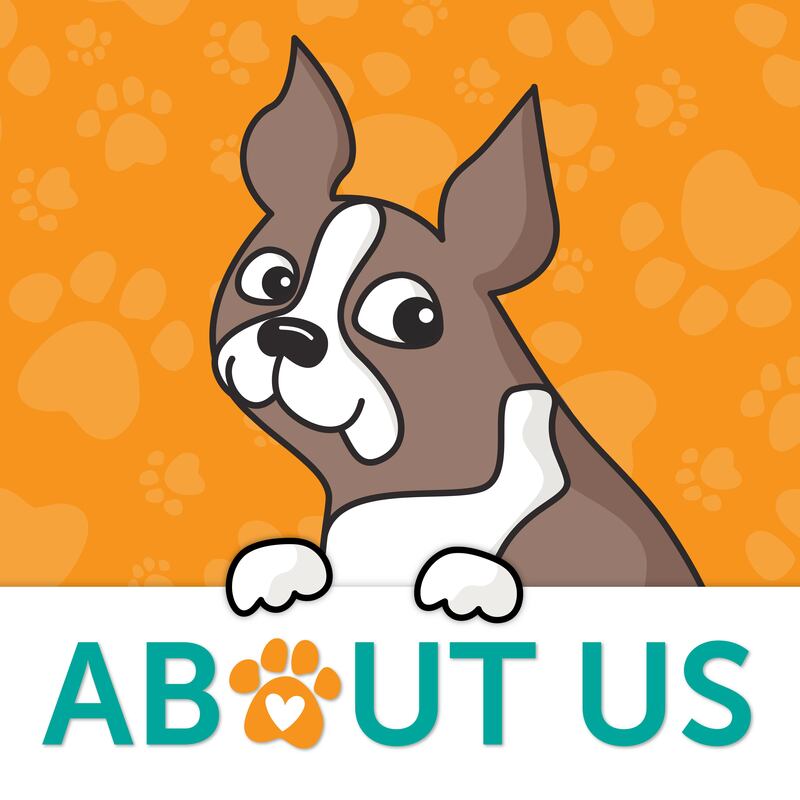 Home | Blog | Heffy Doodle Snail Mail! Hi friends! Happy Thursday! 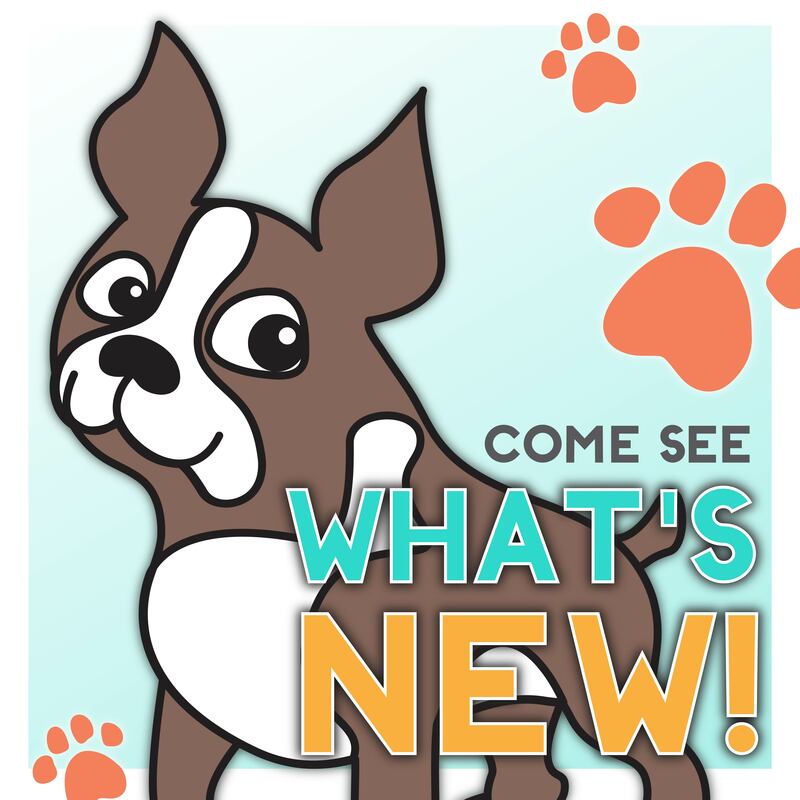 Please welcome back special guest Lesley Oman of Heffy Doodle to share a special snail mail card with us today! 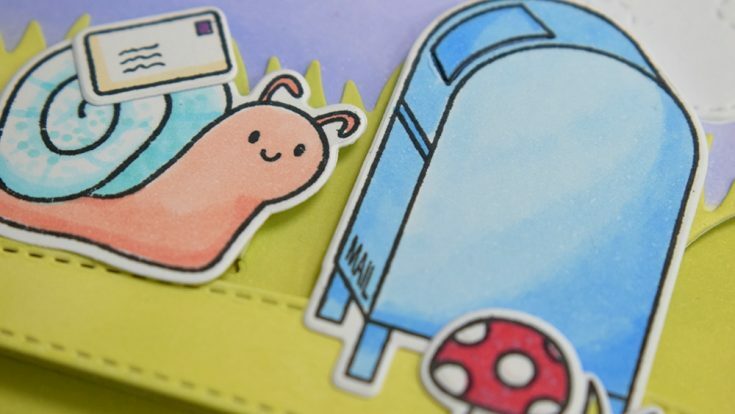 I have always loved the literal and punny version of snail mail and I feel with as our world continues to get more fast paced, the importance of ‘snail mail’ also increases! Read on and be sure to watch the video and enjoy! Its Lesley here, from Heffy Doodle. 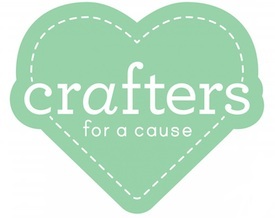 I hope you are all having a super crafty day today! One of my favorite things to do is to mix and match stamps. It’s a fun way to stretch your supplies, and often you can come up with some fun creative combinations! 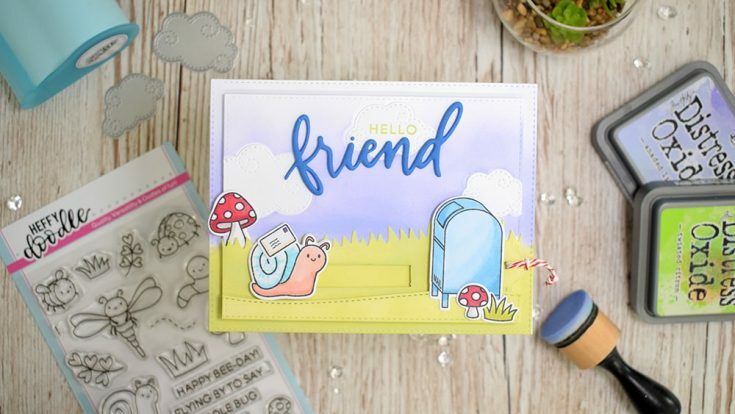 Today I have paired up the Big Bug Hugs stamp set with the Yappy Happy Mail stamps to create this cute snail mail card. 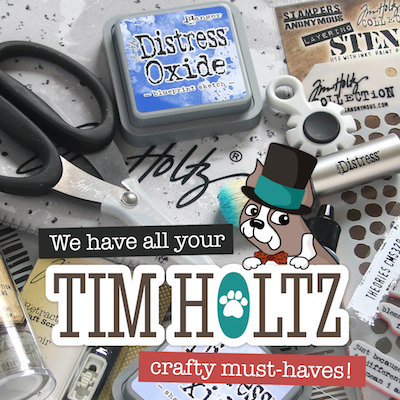 I have also used a variety of Heffy Doodle dies to create my own interactive element on the card! Don’t worry, I have a video to show you how I created the whole card, but let me take you through the main steps of how this cute card came together! To build my card, I used a variety of dies to create a panel to go onto a card blank, first, an A2 rectangle from the Imperial Stitched Rectangle dies, and then two panels using the second largest die from this set. I kept one of these smaller rectangles to be a layering panel, and the second piece I used to cut down a grassy edged panel (using the Grassy Lass dies) and a curved panel (using the Stitched Slopey Joes dies). Of course, these panels needed some color, so I used the Twisted Citron distress oxide and a foam blending tool to make them a beautiful, bright green color. For the sky, I wanted something a little different, so I reached for my Swirly Cloud dies. I used these with a tan embossing mat to deboss these onto the sky piece of my card panel. Next, I cut out some cloud shaped masks using the Heffy low tack memo tape, covered the debossed clouds and then inked on the sky. Today I wanted a fun purple sky, so I used some Shaded Lilac for a soft purple tone. My favorite bit is definitely pulling away the mask to reveal the bright white clouds beneath! 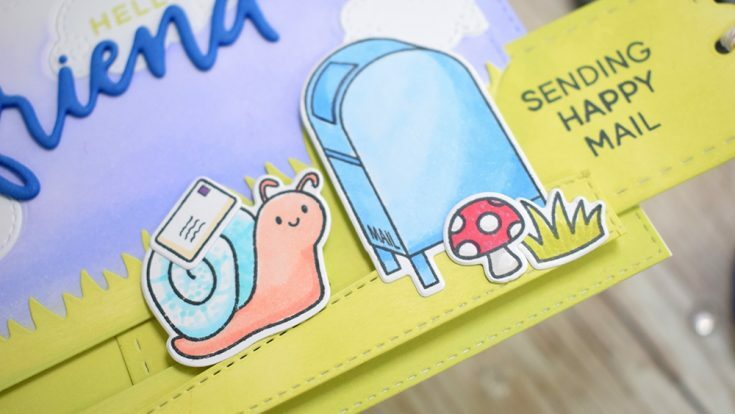 I had the idea to create a slider card where the little snail is carrying his letter to the mailbox, ready to send to his crafty friend! Viva la snail mail!! Haha! I didn’t have a slider die to hand, but I used a banner die from the Heffy Doodle Tag Along die set to create a rectangular channel on the card panel. I then used one of the bookmark dies from the Heffy Doodle Mark My Words die set to create a pull out element. I colored this up using the same Twisted Citron distress oxide so it would blend in nicely behind Mister snail. Next, it was time to stamp my images. I used my MISTI tool to stamp everything at once, making it super easy and really quick. The snail, toadstools and grassy images are from the Big Bug Hugs stamp set and the mailbox and letter are from the Yappy Happy Mail stamp set. I colored the images in using from alcohol markers for a fun blended look. To assemble everything, I used some foam adhesive, making sure that there was enough room for the sliding panel to come in and out, and I secured my snail onto the sliding panel with a small piece of foam adhesive also. As the pullout panel is actually a bookmark die, it already had a hole in it, so I simply added a little bakers twine so it was noticeable and easy to grip. I thought it would be fun to add a ‘Sending Happy Mail’ sentiment onto this pullout panel too! The stamps are from the Yappy Happy Mail set. To finish off, I wanted to add a main sentiment to the card. 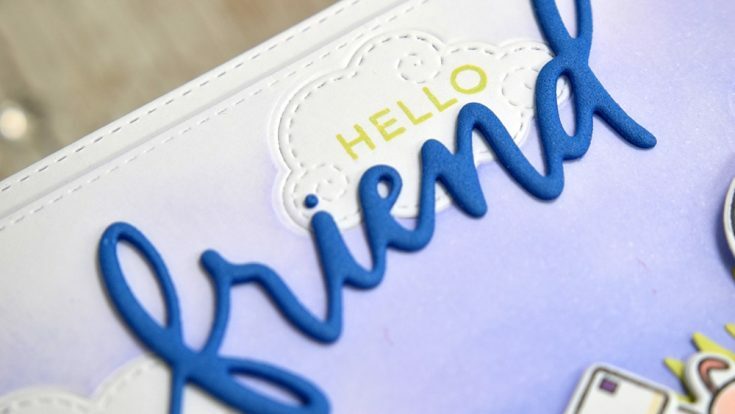 I decided to bring the blue of the mailbox into the card a little more by die cutting the word ‘friend’ out of some blue craft foam which had Stick-It adhesive applied to the back. Then I found the word ‘hello’ in my Veggie Patch stamp set and added this to the cloud just above the die cut word. It was really fun watching this card all come together, and I hope you have been inspired to look through your stamps and see if you can find any perfect partnerships that would create a fun combination. Now to decide who mister snail should mail this card to! Happy Mail is the best! What was the last Happy Mail that you received? Leave me a comment to let me know! 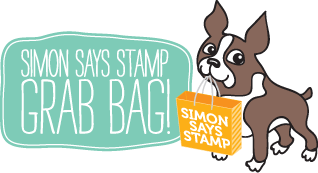 Triblend at Simon Says STAMP! 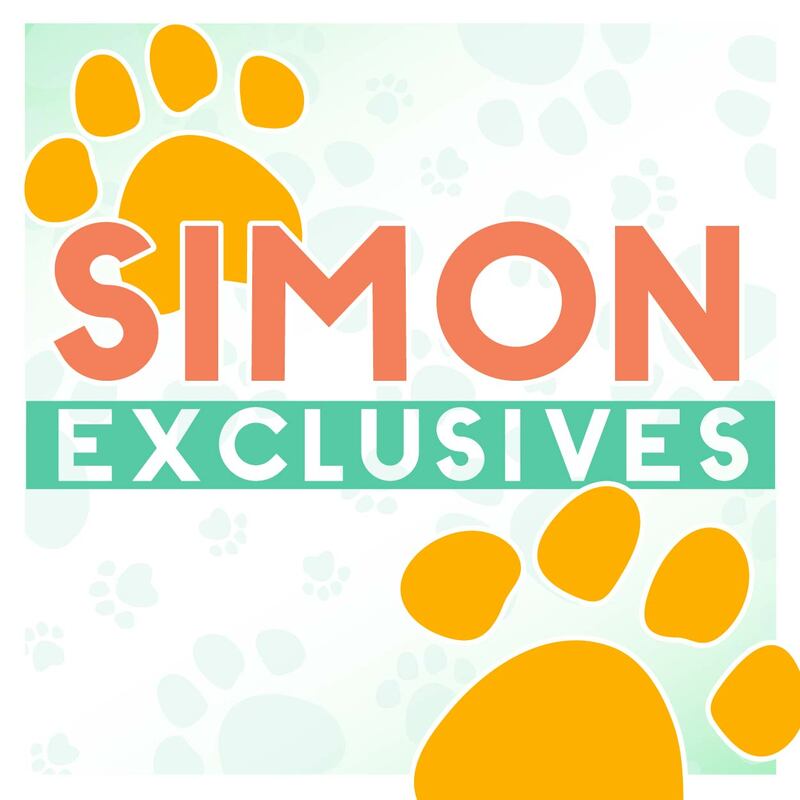 Thanks so much for stopping by and thanks to Lesley for being our guest! Love interactive cards and this one is super! 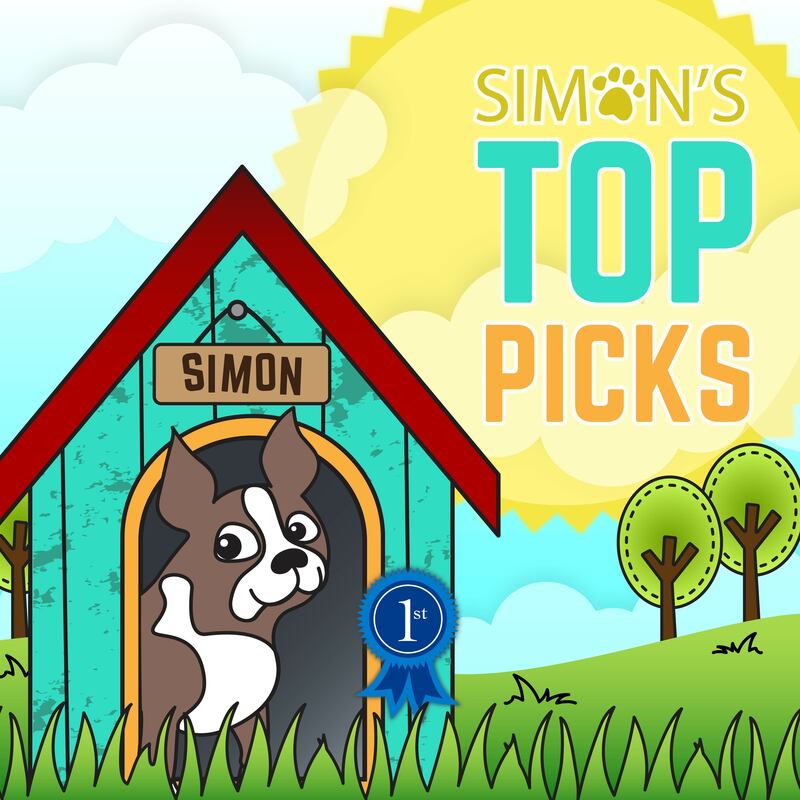 Thanks for sharing and for a great video! Great stamps and a simply adorable card! Thanks! What fun! Such a darling card. Thank you for the inspiration. So cute and fun, I love that snail! Fun card. Who doesn’t love snail mail. I already follow by email. Such a cute card! And of course we all support snail mail. 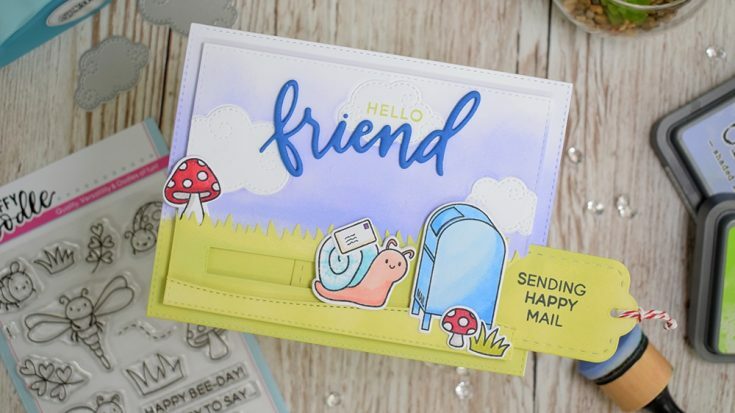 Cute slider with the snail and mailbox! Oh so cute and that little slider snail is just too fun! Such a great and adorable card! Hi Lesley. Well, your company has gone ahead in leaps and bounds since I first saw you announcing the start of everything. Congratulations on doing so well. 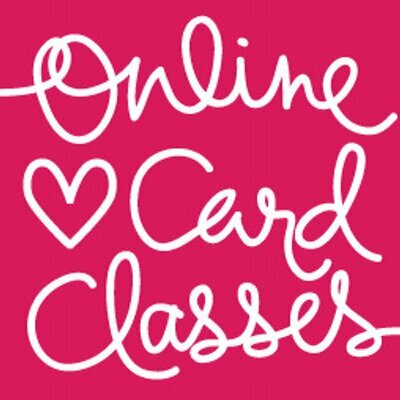 Just LOVE this sweet little snail mail card – cute and simple, yet with the interaction. Thanks for sharing. Such fun and cute cards. Love sending snail mail. This snail mail interactive card is about the cutest card I have seen for a while. Fun card! Love that snail! This Little snail carrying the letter is too cute. Such a fun interactive card! I love sending and receiving snail mail!! And I love interactive cards, so this card is fantastic!! Thanks for sharing your beautiful and fun card. This is such a cute and clever card! Love Snail Mail, so cute for the play on words. Love the slider idea. It really is amazing all the differnt things you can do with a slider. Cute card! I love how you created the slider card with the flagged banner die and the bookmark die. So creative! A fun slider and a great way to sent a message! Such a cute interactive card with the snail mail. Fabulous, fun card – I love snail mail!